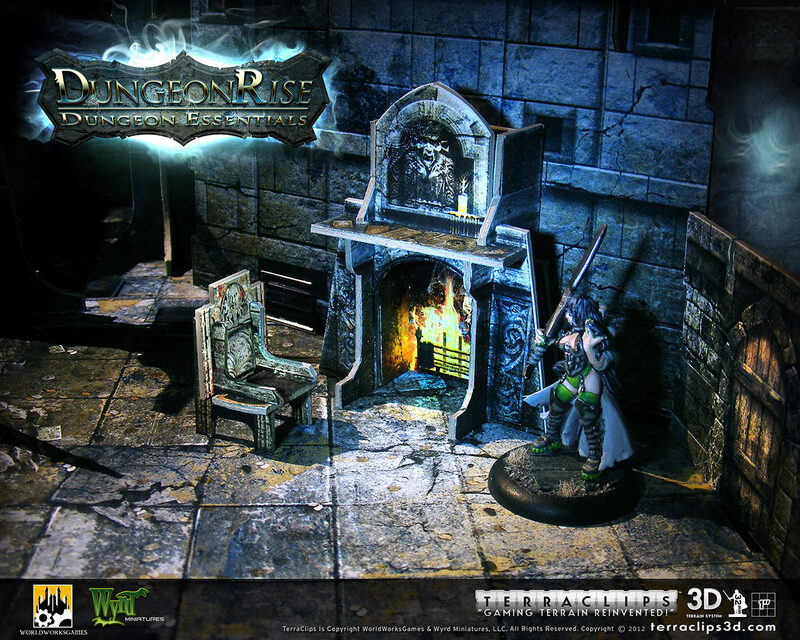 WorldWorksGames • View topic - DungeonRise: Available and REVEAL! 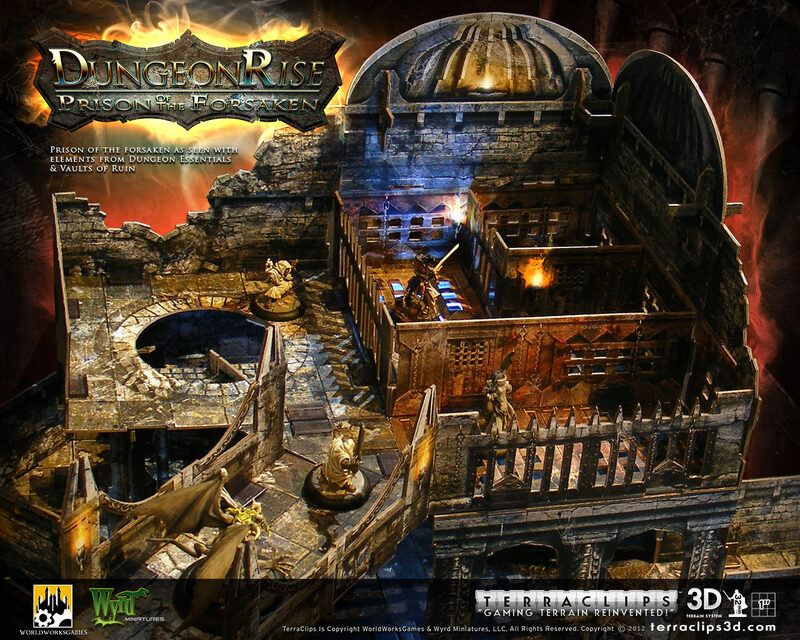 Post subject: DungeonRise: Available and REVEAL! 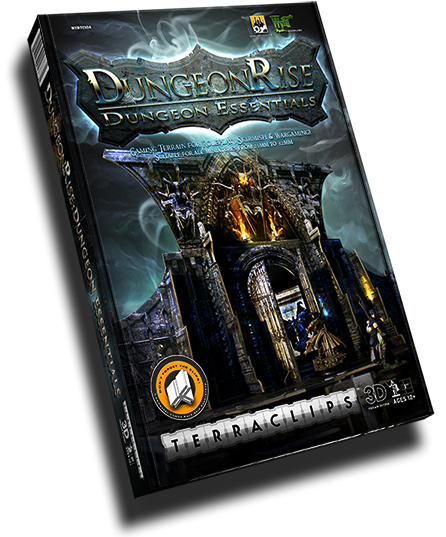 The worlds most complete tabletop dungeon DungeonRise viewtopic.php?f=90&t=11438 trilogy is available right NOW!!! 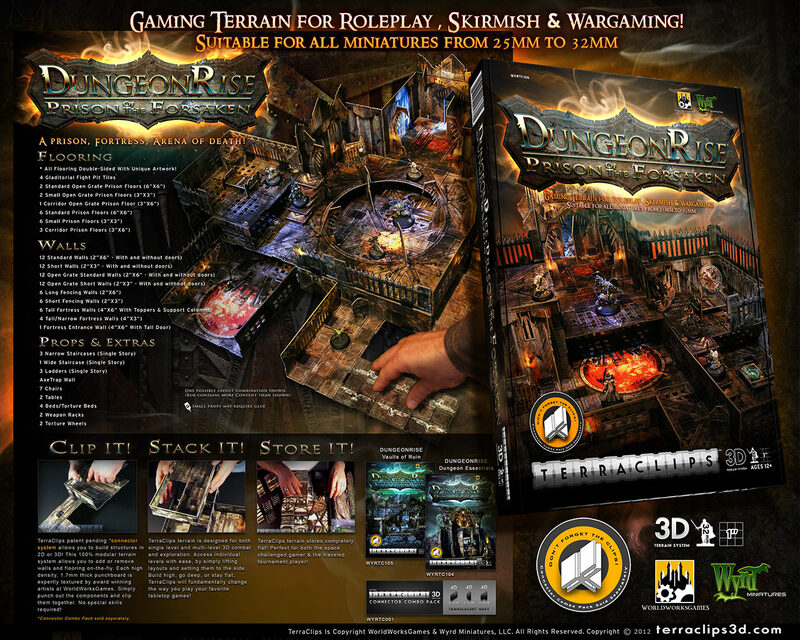 You can grab yours via Wyrd Miniatures at http://wyrd-games.net/shop/ or at your favorite brick and mortar games store! 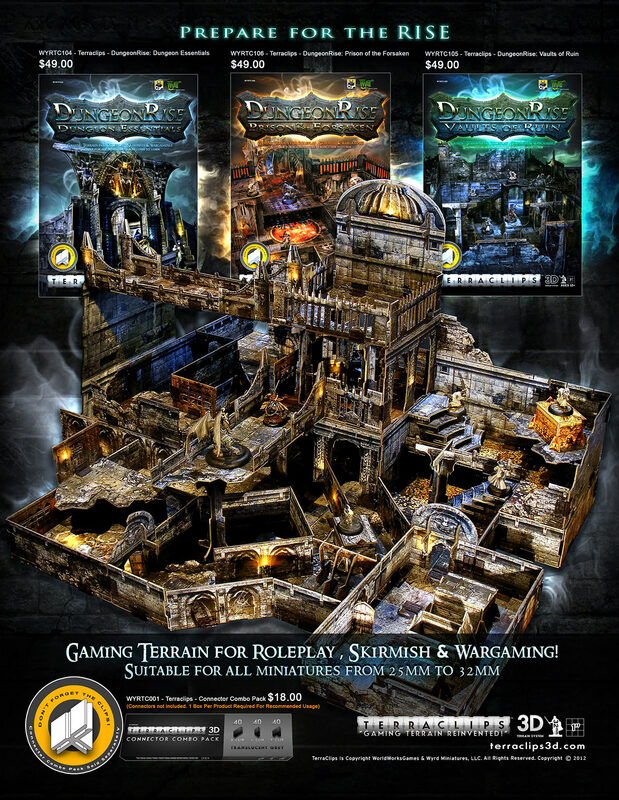 DungeonRise is a groundbreaking, generic 3-part dungeon themed terrain setting designed for all of your Role Play, Skirmish or Wargaming needs. 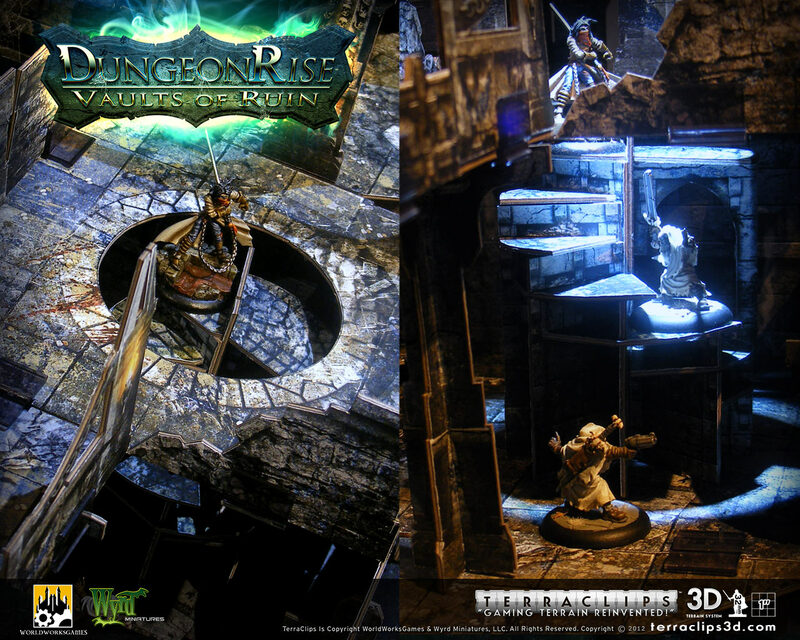 Dungeon Essentials, Vaults of Ruin & Prison of the Forsaken have been artfully crafted to work together to create breathtaking and varied dungeon expanses or to stand alone independently. 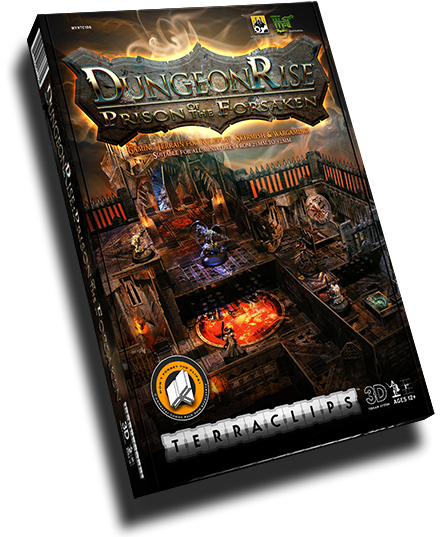 Utilizing the TerraClips terrain system, DungeonRise gives gamers the ultimate toolkit to create incredible 2D and fully 3D, modular, multi-level environments! Simply punch out the robust 1.7mm punchboard components, clip them together, add or remove walls on-the-fly, build up, build down and have a ton of fun in the process!!! Punch it out, clip it together and get playing! 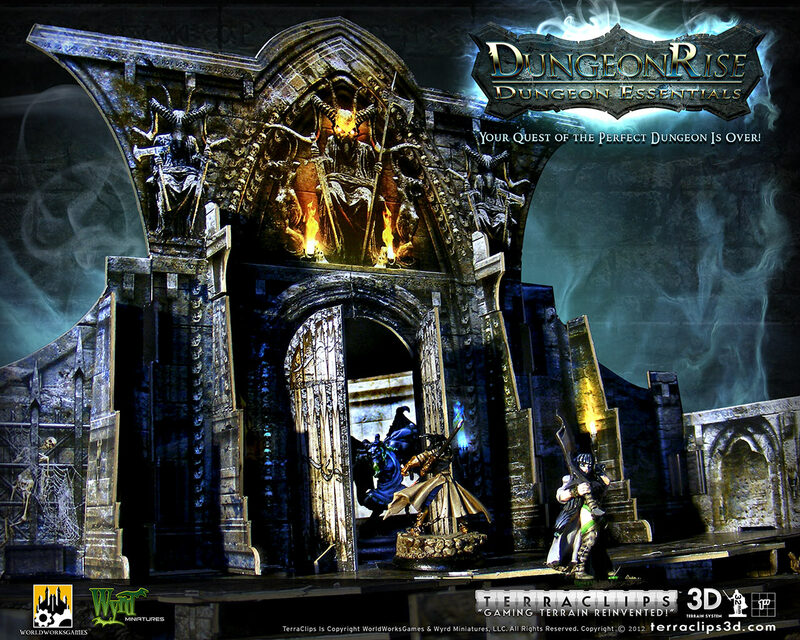 Your quest for the perfect dungeon is over! (or at least we're giving you one heck of a try at it!). 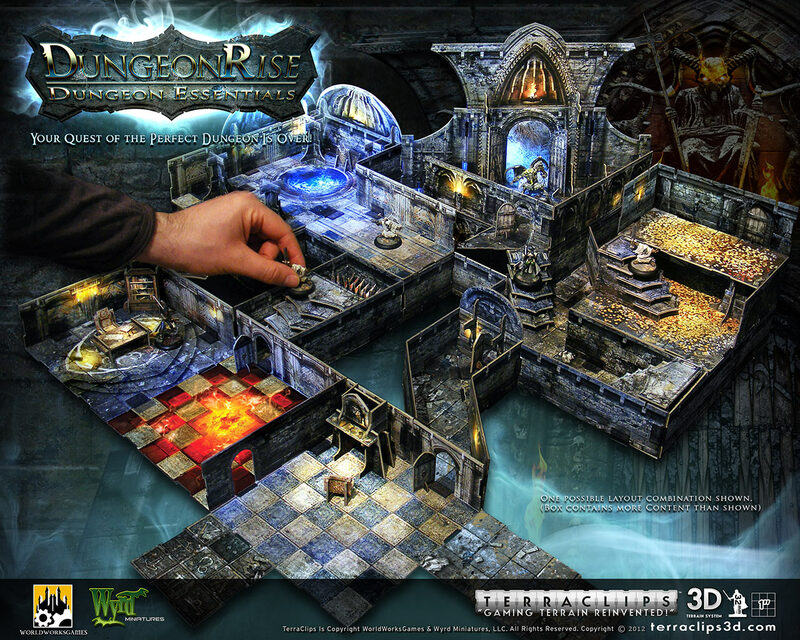 DungeonRise: Dungeon Essentials gives you all the components you need to create the ultimate tabletop dungeon, with unprecedented modularity and at a fraction of the cost of other alternatives. 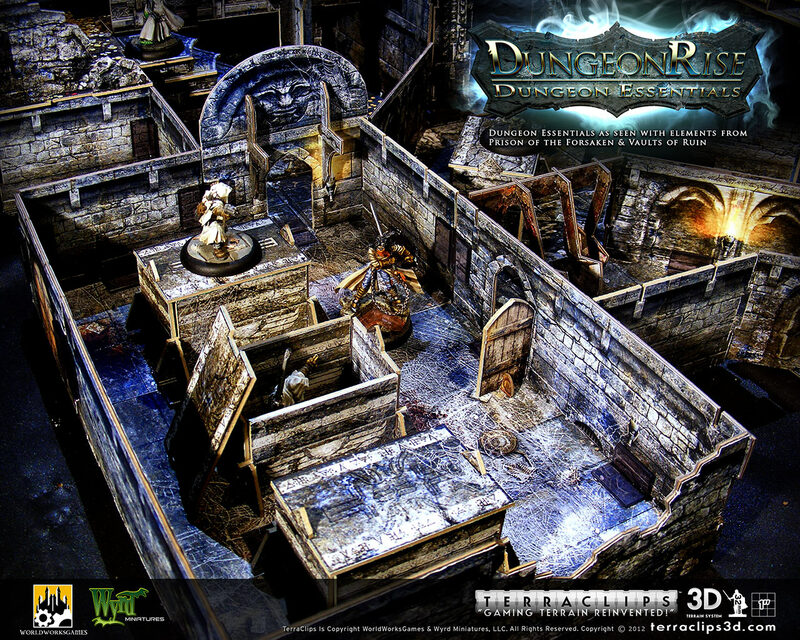 Dungeon Essentials features a foreboding dungeon entrance, double sided tiles & walls full of unique artwork and locations, angular flooring, stairs, columns, 3D dungeon props, 3D traps, stairs and over 51 unique FX tokens! 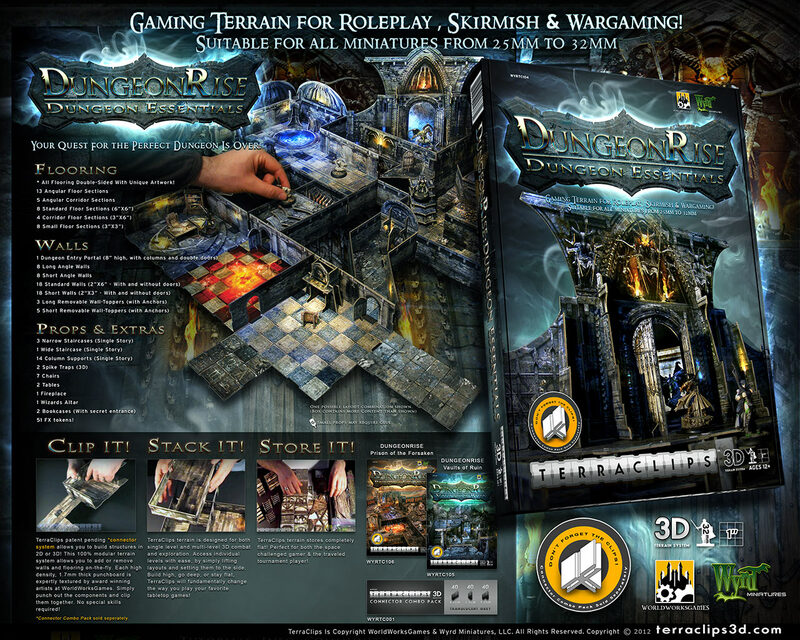 All of these incredible features combine to bring you one of the most comprehensive dungeon locations ever brought to the tabletop market! All Flooring Double-Sided With Unique Artwork! A prison, fortress, arena of death! 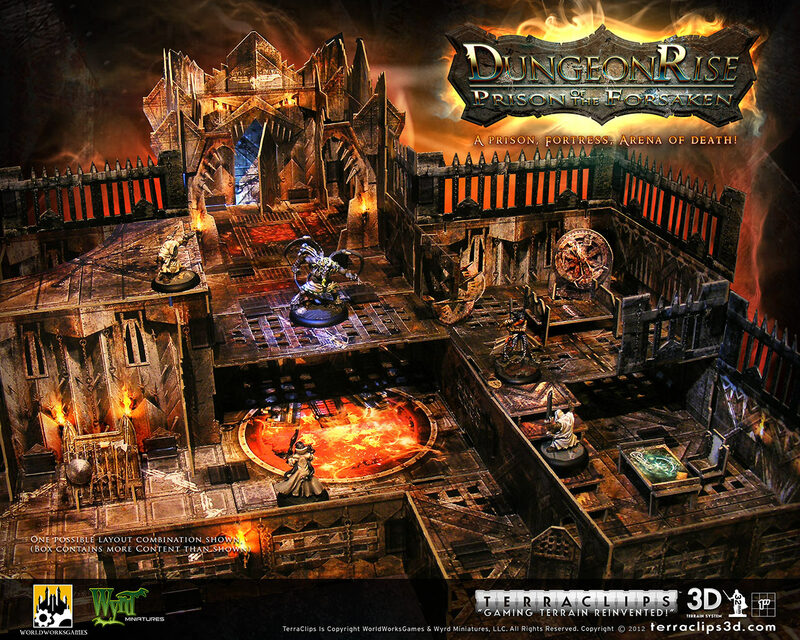 DungeonRise: Prison of the Forsaken is not only the worlds most feared prison but it is also a notorious fortress host to horrific gladiatorial combat in the arena! 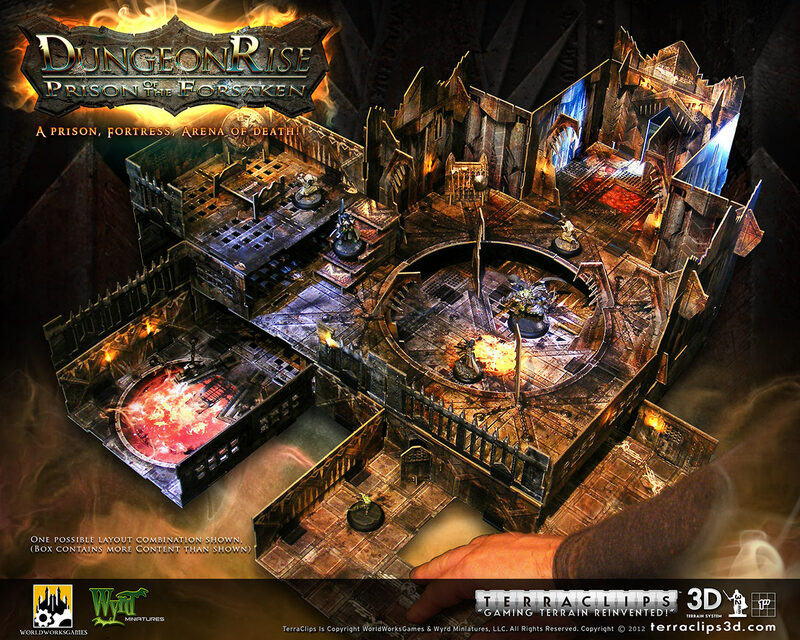 DungeonRise: Prison of the Forsaken features a complete and expandable elevated fighting pit, torture chambers with 3D props, single and towering double-height fortress walls, fortified wall toppers, spiked columns, gated and bared cell walls and richly detailed floor tiles. Ancient vaults, deep, dark, cold! What horrors await your players? 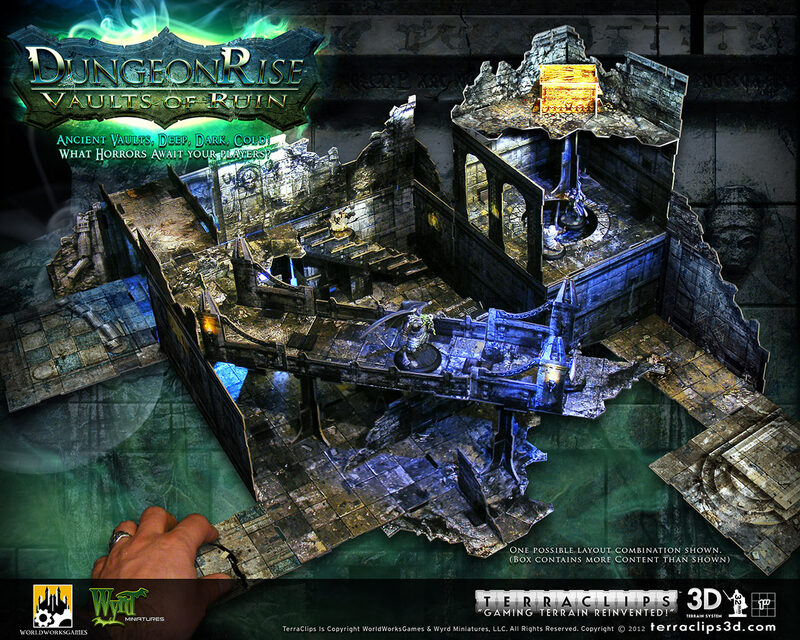 DungeonRise: Vaults of Ruin takes you deep into the heart of a ruined, ancient keep full of dark secrets. This setting is all about creating a dramatic and engaging tabletop showpiece guaranteed to inspire exploration and awe! DungeonRise: Vaults of Ruin features destroyed walls in single and double-height flavors, normal and broken floors, freefloating rubble piles, bridges, spiral staircases, crumbling stair walls, arch walls, double-height support columns and open-able sarcophagus! 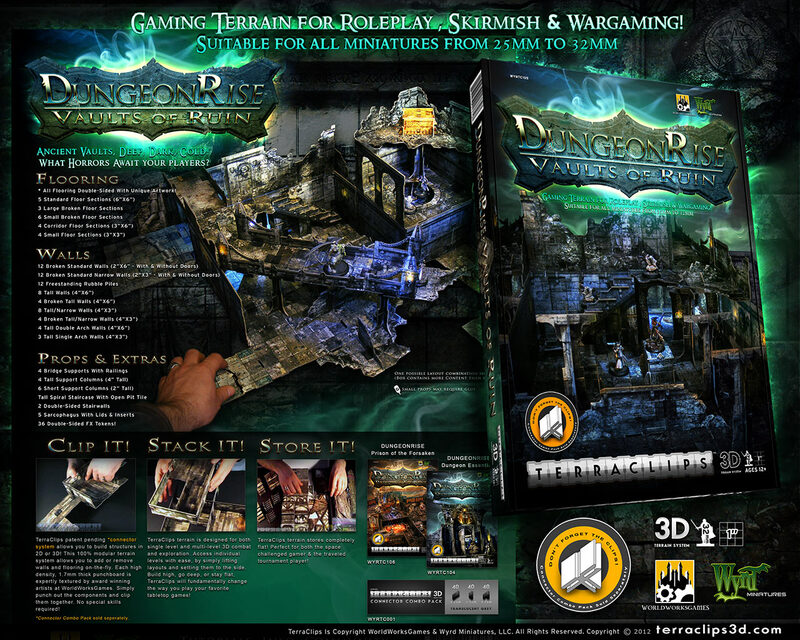 Post subject: Re: DungeonRise: COMPLETE REVEAL! soooo....um.....dang! these look sweet. I have a couple of questions however. I'm assuming you've done play testing with various table top games and such? I'm just thinking about my D&D group and the whole "fog of war" type thing. How would you go about slowly revealing the dungeon if it's stacked all on top of each other like this? I'm not saying it's a negative thing, I'm just curious how you would recommend doing it? Who do you think would win a fight between pirates and ninjas? I think pirates would, but just because they say "booty" a lot. The same tactic applies to TLX builds and previous TCPs sets. I build in chunks. In something like this, I would build a large room or a few rooms as one "chunk" that sits right next to another "chunk." Each level would do the same and I would add sections as needed. The other way that I have handled things is to lay out much of the set up, but not place props or minis and just tell the players to not metagame (this doesn't work with every group). I guess that you could also cover things with specifically cut pieces of paper or something if you really desired. To maintain the fog of war thingie, I build in pieces, at the table, during play. Yes, It does slow things down, but just a bit. I have everything built out before they show and it is very easy to lay down a room, or corridor, when needed. I do use the TLX format, but these are essentially the same, in that they are modular and can be added quickly. By the way WWG. Nice work. Wish I could afford to drop $500 for these. And $500 for the last group. This stuff really is awesome. Will have to do with my TLX stuff, but I really don't feel slighted. I love my TLX. I still can't get over just how great they look. The quality of the artwork just blows my mind. I don't know how you keep amazing me after all these years, but you've done it again. I'm itching to make a preorder. No way I'm letting these sell out without picking up a set! damn if they are good! really a nice addition and i love how you thinked "out of the square"
Will printable-PDF TerrainLinx versions be available at some point? Denny has said on several occasions that the TCP stuff will be unique to TCP. There will be no sharing between brands. I can see his reasoning. Some people like me, and apparently you (and others) would simply wait until the TLX release would come out, then make our purchases. As it stands now, I could purchase this stuff (imagining I had the money) and use it along side my TLX stuff. I am sure it would work just fine even if they don't join up properly. What I can't imagine is buying just one set. Two each, of every set would be my minimum. Ten might be a more imaginable number for me, maybe twenty. I don't do anything small. Lovely sets here. but I'm still seeing one problem. Everything is 3x3 and 6x6 scale. 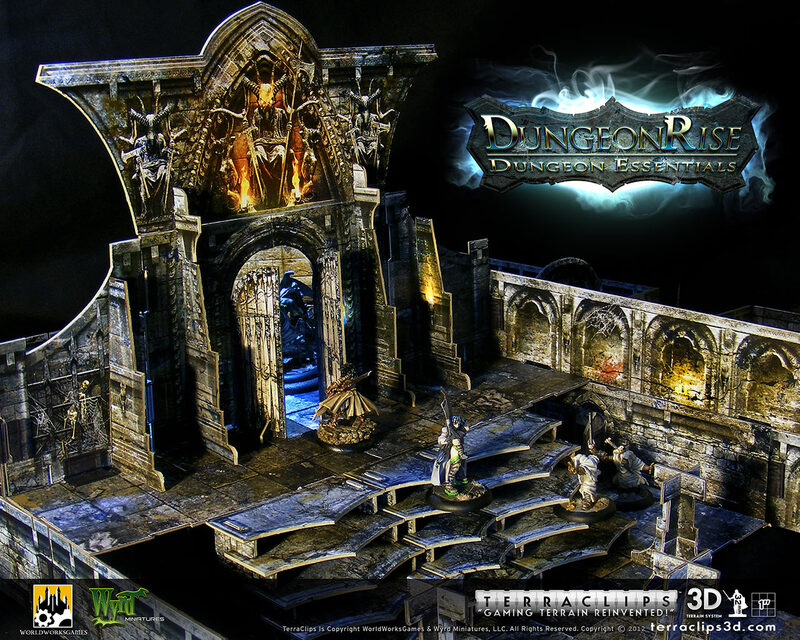 I know its probably a limitation on the medium but was wondering how to emulate all those beautiful dungeons I have in many D&D modules with these? you know, 5ft and 10 ft corridors, etc. Maybe you guys have something planned or will this be a papercraft only thing. I've also created 5' wide halls out of 3x3 tiles by blacking out the outer two rows with GIMP. Also made a long 5' wide corridor with alcoves the same way. Granted, that was with TLX, but I've got some TCP custom pieces I've made from my TLX sets. Edit: Just to make clear, I'm not the creator of the build in the referenced thread. 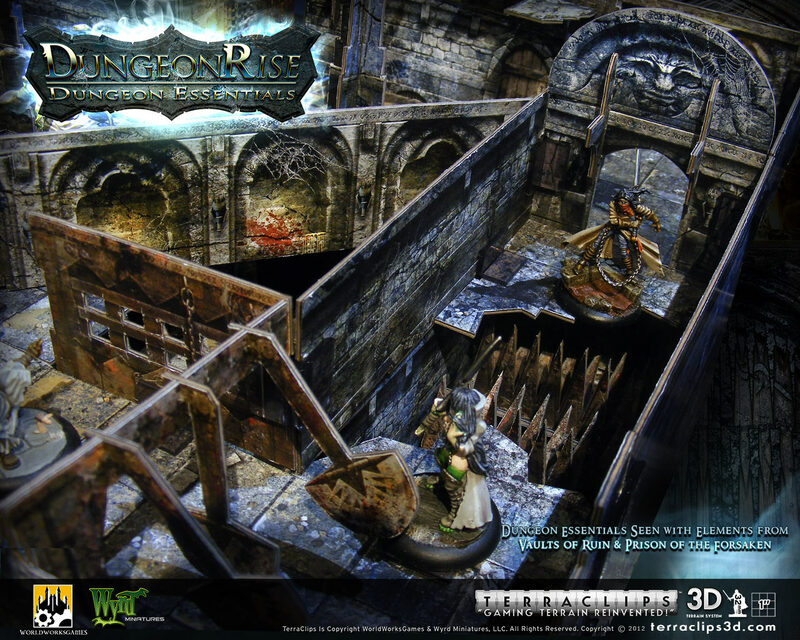 Yah, I like customizing my dungeon terrain, but sometimes it takes a couple of tries to get it looking right - don't really want to do that with commercially purchased "hard copies". Still, I guess I can mix and match it with the TerrainLinx stuff. How compatable are the printable and pre-made sets? Actually the corridors would be 7.5' wide as balconies are 1.5". very nice, Congratulations on the excellent high standard. And all those details that not only look superb, they make it work even better. Stairs, straight and spiral (Who other than Denny could possibly manage to include spiral stairs in a baseline tile/terrain set? ), I'm looking at you right now. Going back to the other details shortly. p.s. I hope you've cranked the production volumes up this time, Denny. These look to be even better sellers than the original sets. 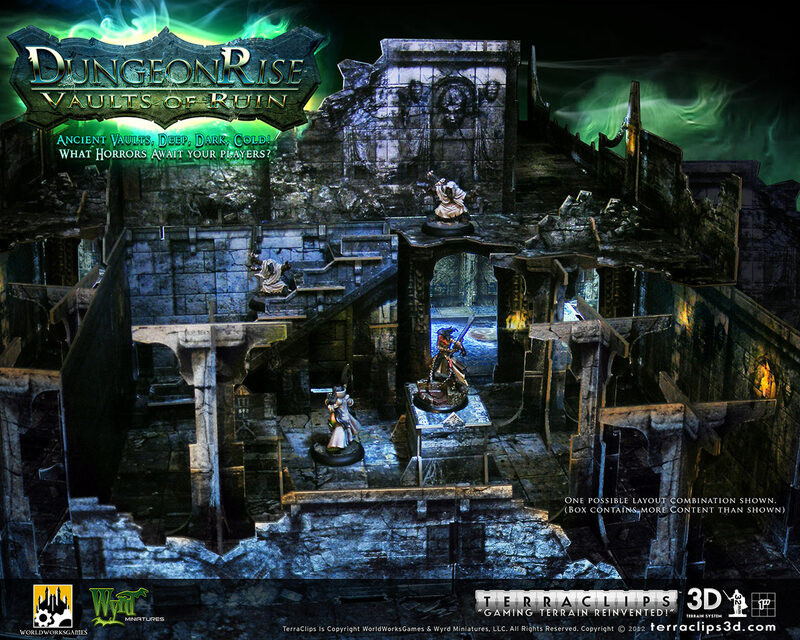 I must admit WWG has outdone themselves here and I'll be amazed if this doesn't outsell the Malifaux set by miles (nothing wrong with the Malifaux sets ). The level of detail is amazing and the the unique shapes just put the icing on the cake! Two of each set for me I think. First off, thank you so much for the kind words gang. It was a real pleasure having the chance to think about dungeons again and how to approach that with some freshness. I have to admit, its pretty satisfying to finally get a product out there that I think (hopefully) matches what many tabletop players have had in their heads for so many years. I really hope people enjoy these as much as I enjoyed making them! A lot of time was spent in early development prototyping the tight corridor issue. TerraClips uses a "clean modularity" standard so that you can design a 3D, multi-level layout that cleanly links back into itself. To accommodate 5' or 10' corridors within that construct is basically a gigantic puzzle full of dozens of unique pieces (both floors and walls). Not impossible mind you, just really extensive and impractical (nearly a release in and of itself). In the short term some have already mentioned creative solutions. For the most part, due to the impractical nature of tight corridors in a 3D walled environment, we often recommend a simple upscale of tighter corridor sections (to accommodate chubby fingers and giant swords). Another simple solution might be to add freefloating strips or overlays which tighten existing corridors in a fog-of war kind of way. If the support was there, a 5'/10' expansion pack could technically be developed but its definitely its own thing due to the extensive content required to make it work. p.s. could you show a close up of the half-stairs that go along the wall please? 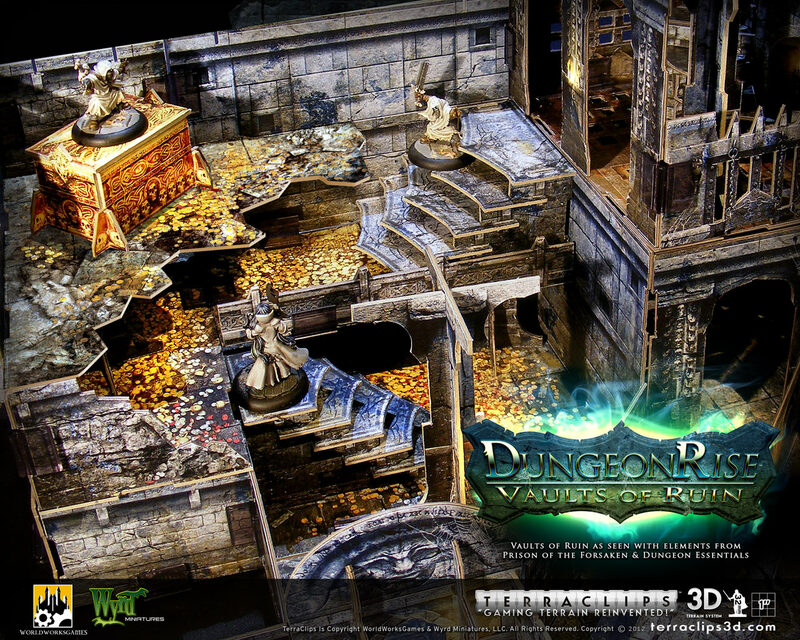 Is their going to be software support for a dungeon builder? Would be very useful having a catalog of bits so you don't have to just bash everything together and hope you have enough bits. I would say four of each set would give you a bit of confidence you can build what you want. Ten sets would give you pretty strong confidence to build what you wish. And the twenty sets I would need would give me confidence to use my imagination without limits. Yeah, twenty sets of each. Like I don't really need to pay my mortgage this month. lol Or next month. Not to my taste. Way too busy graphically. For a generic set these has more theme and ambiance then most of the other fantasy setting stuff, which greatly limits their use for me. Geez, if these sets are going to GenCon you'd better have a semi or two fully loaded to meet the demand. How could anyone resist picking them up ... they are so beautiful, so functional ... so darn incredible!!!! ... and no shippimg if you buy them there. I hope they are going to be available then. Just an aside note, Denny, you really know how to design the packaging for maximum punch. You don't waste an inch of sale space. Darn you are good. I can hardly wait for you to put out a three box set for sci-fi. Those look fantastic, I'll be sure to check them out when they are available! depends on the wife. Mine would, she knows I give up gaming stuff to get her shinys . So she does get me gaming stuff for special days.